Giving up drinking alcohol for an entire month might sound like a crazy idea, but it turns out it comes with quite a few health benefits. According to new research from the University of Sussex in Australia, Dry January (i.e. quitting booze for the first month of the year) can lead to everything from weight loss to increased energy to better skin. Another big benefit of cutting out alcohol for 30 days is that you’ll probably sleep better, says Heather Carey, clinical and culinary nutritionist. Booze is a sedative, which means it’ll initially make you feel sleepy, but overnight it’ll mess with your rapid eye movement sleep and disrupt your night, says Carey. Dry January may even lead to healthier alcohol habits in the long run. The University of Sussex research notes that overall, participants, who did Dry January in 2018, were drinking less than they used to six months after completing their Dry January commitment. “Dry January gives you the chance to re-evaluate the need for drinking,” says Carey. 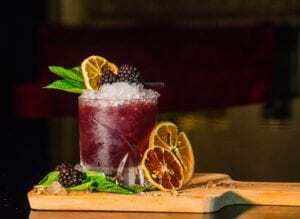 “It makes you more mindful.” And a lot of restaurants are hopping on the trend by adding mocktails to their menus, adds Carey, so you don’t have to feel left out if you’re planning a night out with friends. Interested in cutting back on booze but still want to enjoy some sweet drinks? Here are six yummy mocktail recipes to get you through Dry January and beyond. Ring in any celebratory moment with a faux champagne sip. This bubbly mocktail combines mango juice with non-alcoholic sparkling cider for a tropical twist on the bellini. As a bonus, you’ll also reap antioxidant benefits from the mango. Get the recipe on whatscookinglove.com. If you’re not a fan of super-sweet drinks, then this tart and herby mocktail is the one for you. It features grapefruit juice, a simple lemon thyme syrup, and apple cider vinegar. Get the recipe on satsumadesigns.com. “Most mocktails feel like dressed up soda or fruit punch—not The Cinderella,” Patty Lee, food editor at The Spruce, tells us. “This refreshing mix of tropical fruit juices and bubbly ginger ale gets kicked up with grenadine and Angostura bitters to give the drink a more complex, cocktail-like flavor.” Get the recipe at thespruceeats.com. Be transported to a beach (even if you don’t have any vacations lined up) with this healthier version of the pina colada that includes the addition of banana. (The rum in the recipe is optional.) Get the recipe on namelymarly.com. Mocktails don’t have to be complicated: This delicious grape juice and seltzer mocktail only has three ingredients and looks so pretty with a grape garnish. Get the recipe on tobyamidornutrition.com.